We know you love the latest soccer boot styles and latest soccer boot colors. 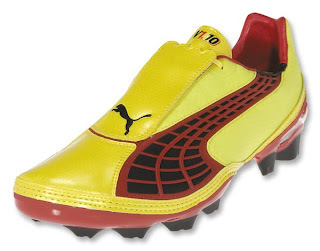 That's why we're glad to bring you the latest creation from the cool cat - The PUMA v1.10 i Soccer Shoes (Blazing Yellow/Black/Chili)! These sick new kicks include a soft, abrasion-resistant microfiber upper with grip texture and a lace cover, and the TPU injected external heel counter offers heel stability and support. With a "Kinte" pattern that is inspired by African soccer. The sole is made up of a lightweight Pebax frame, which is transparent in mid-foot and heel. Carbon fiber composite is embedded in the forefoot. And a pointed stud configuration ensures smooth ground penetration, optimal traction and stability. It weighs only 8.2 ounces.